It seems like the vaping world changes at lightning speed, and it’s no surprise why. With such an active online community and enthusiasts sharing new ideas every day, vapers and manufacturers are constantly expected to adapt. Right now, we’re seeing that first-hand in the form of squonking, a vaping method that has taken the world by storm in the past year or two. Like most novel vape methods, this one strives to solve a common problem: the dripper’s need to constantly re-supply vaping e-juice to the tank or coil. At long last, there’s a way to enjoy the flavour, power and cloud output of dripping with the convenience of liquid on demand! Squonking has its pros and cons, of course, but it’s definitely a method to consider for those interested in trying out new and more convenient ways to vape. In the most basic terms, squonking is essentially vaping with a mod that has a built-in e-liquid bottle. Rather than pouring liquid into the top of the vape tank every time you want to puff, squonking allows you to squeeze an integrated reservoir that saturates the cotton for a flavourful, on-demand vaping experience without as much pouring. While you might think to yourself that this problem has already been solved with the addition of the tank in an RDTA, that’s not so. Typically, an RDTA tank only has the ability to hold 5 millilitres max, while a squonk mod can store up to 8 millilitres, depending on which size mod you choose. If you’re familiar with a regular dripper mod, you know that the e-juice must come into contact with the coils to turn it into vapour and give you the vaping experience you expect. The primary difference between this system and squonking is that you don’t have to pour the liquid onto the unit every single time (in other words, there’s no dripping). Instead, you simply squeeze a bottle within the mod, releasing juice to the RDA portion of the mod. It’s like an instant drip! To get more technical, here’s what happens when you squonk. Your e-liquid supply is housed within the mod in a squeezable squonking bottle with an opening for a hollow tube and a bottom-feeding pin. When you squeeze the bottle portion of the mod, liquid will be sent up to the RDA through that channel. When you release the bottle, a vacuum-like suction will pull down any excess juice to prevent waste. You can then turn the vape on and vape like normal until you find that you need to squeeze a little more juice up to the top to restore the flavour. Sick of Dripping—The primary reason why you might switch from using an RDA with a regulated (or standard) box mod to a squonk mod is because you’re sick of having to manually refill your dripper for the most enjoyable puff. These kinds of mods can quadruple how much e-liquid is housed within the unit, significantly decreasing the time and energy associated with re-dripping. Basically, squonking doesn’t require the frequent refilling associated with RDAs and RDTAs. Tired of the Mess—Another great benefit of squonking is that, since you don’t have to re-drip constantly for the same flavour, you’re less likely to spill expensive and messy e-liquid while you’re vaping. When your squonking bottle runs out, you simply refill the entire bottle, so there’s a lot less pouring involved. 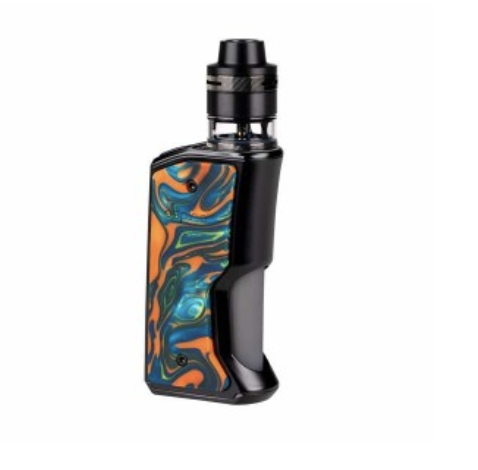 An On–the-Go Vaper—Everyday vapers need the ability to enjoy their vape while they’re working, on the go, and basically doing anything else that might require their attention. With regular drippers, you’re constantly being taken away from what you’re doing to refill the RDA. With a squonk mod, you only need one hand to re-saturate the cotton for a flavourful puff. It’s also easier to take your vape on the go when you’re squonking because you won’t have to carry around extra bottles. It’s all built in. There’s no one who really shouldn’t squonk, but we definitely don’t recommend this vaping method for those vape enthusiasts who tend to go through more than a battery’s worth of power every day. Unfortunately, the major drawback of squonking is that, to free up space for the bottle, the mod must compromise in terms of battery power. For some people, having the extra juice capacity isn’t worth handing over power or portability. If you’ve decided squonking is right for you…congratulations and welcome to the club! The great thing about squonking is that squonk mods are rebuildable, so they can be tinkered with time and time again and save you some money by replacing parts. However, it is hard to retrofit any old mod with a squonking bottle, so you might need to make a new mod investment. We would definitely recommend getting started with squonking by investing in a squonk mod and suitable RDA. If you’d like to use your existing RDA, just make sure that you look for a squonk mod that has a bottom-feeding pin, otherwise known as a squonk pin. Once you get your setup in place, squeeze away!